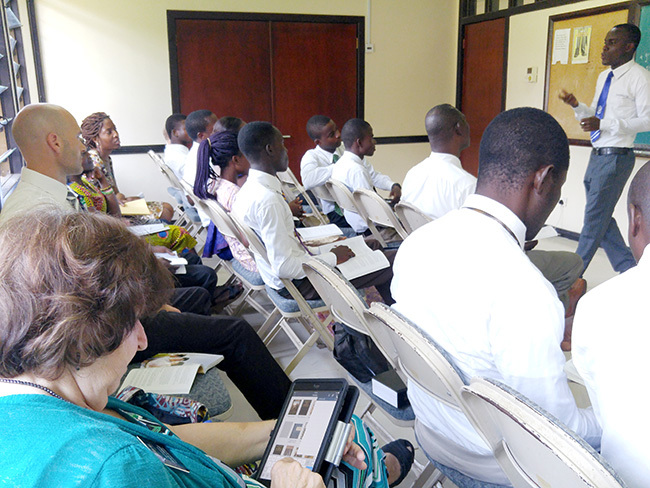 Ghana is the most religious country in the world according to studies by the Pew Educational Trust in Philadelphia. According to their research, 85 % of the population regularly attend a church or mosque in this country of 25 million people. There are about 16 million Christians and 55,000 members of The Church of Jesus Christ of Latter Day Saints (a.k.a Mormons). In case there is any confusion, “Mormons” are Christian. There are people in this world that have been taught otherwise, or just misunderstand because of that nickname, but everything we base our faith around is through our Savior Jesus Christ. We read and study from The Holy Bible and also The Book of Mormon which is ANOTHER testament of Jesus Christ, a history of the people on the American continent. 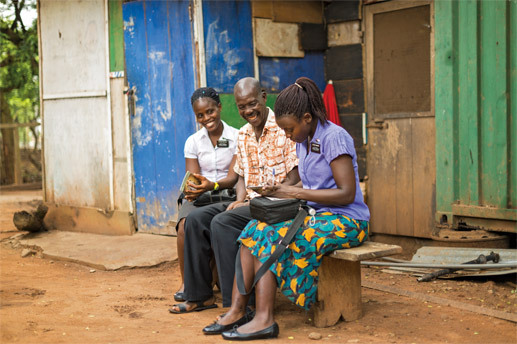 We believe that God spoke to, and visited those that inhabited the earth on every continent “back in the day”, not just limited to those that lived near where Jesus was born, The Book of Mormon begins with the record of a family who were asked to leave Jerusalem before it was destroyed. The record of The Book of Mormon gives an account of two great civilizations. One came from Jerusalem in 600 B.C. and afterward separated into two nations. The other came much earlier when the Lord confounded the tongues at the Tower of Babel. They are among the ancestors of the American Indians. Soooo, now that we have that out there, it’s the whole purpose of missionary work does across the world, to help spread the good news of The Book of Mormon. If you get good, happy feelings while reading The Holy Bible, you will love the beauty of The Book of Mormon as well. Just like the Bible, it’s a record of the struggle we all experience on a daily basis of choosing good over…not so good. It chronicles the mistakes of a people, and how hey learned from their mistakes. It provides uplifting resources, that help strengthen our faith in our Savior, and even MORE accounts of how much our Father in Heaven knows us and loves us. We all know that the Bible was written in it’s original form, then translated from Latin to Greek to Hebrew from lots of different people, and how John Wycliffe and William Tyndale died so that others could have their own copies, which the early church did not approve of. So many people in between that it’s not in it’s true pure form (even today’s modernized versions are tweaked a bit). I recently purchased this great flip book to help myself and my kids better understand the history of the Bible and how it came to be that we all have copies in our hands (thank you, printing press invention!). The Book of Mormon was written by it’s original authors, then translated by just one person, which is what we read today. Together, we believe The Bible and The Book of Mormon work together (not against each other) to help us live a happy and enriched life, despite trials that come our way, either by mistakes that we made, or by the inevitable course of challenge in our life, that tests us, and ultimately makes us stronger, or brings us down to despair. I choose strength. Faith over Fear. Did you know that gospel means “good news?” Well, it does. Want to know some other good news?? We believe that there is a Prophet on the earth today, to guide us to find happiness, just as in the Bible times. We hear from him, the 12 apostles called to serve with him, and other leaders on a regular basis. More formally, twice a year, in a General Worldwide Conference, the first weekend in April and October. They share messages of hope, stories of triumph over adversity, and guidance to help us in these modern days. If you’d like to meet these great and inspiring men, you can read about them HERE. 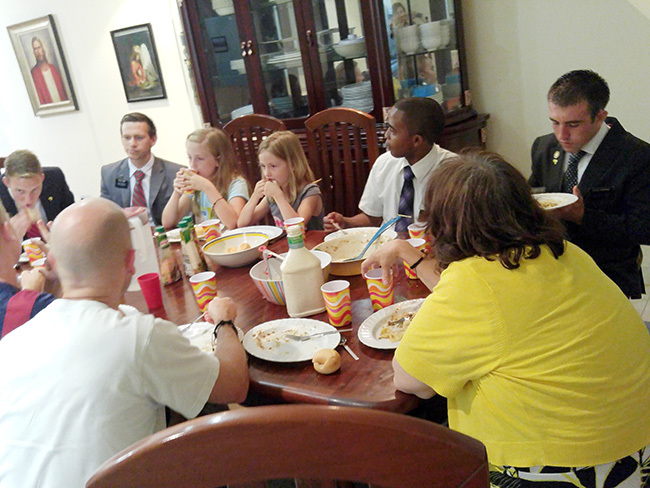 They lived lives with full time jobs before their call to serve, are not paid, and often share stories from their vocations in inspirational talks. 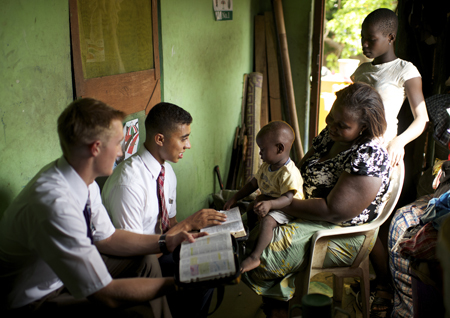 OKAY, so now that all of that history is out of the way, THAT’S WHY WE DO MISSIONARY WORK! 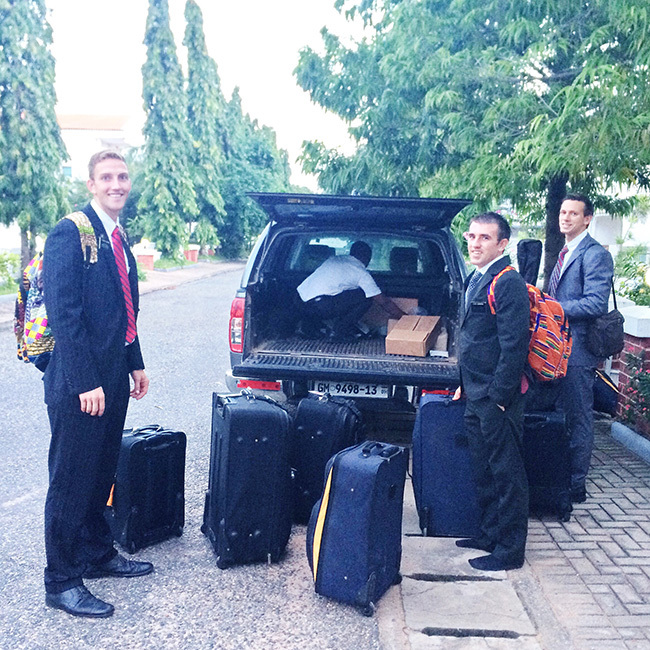 Across the world as full time missionaries go out to share, but also, we as members, strive to share our joy in our daily lives, because WHY NOT SHARE JOY?? We feel so blessed to have the understanding that we do, that we want to share it with others. But we get it…people don’t want “in your face” and generally most people are content with their faith and understanding, and often times people are annoyed to have religion pushed in their faces. Yep, yep, we get that too. We aim not to be pushy, but helpful. I see the JW walk my neighborhood, and I think, “bless their faithful hearts” and show kindness when they share, and I know that many others likely think the same things when they see our missionaries going door to door. We feel it is so important though, even despite the adversity that comes from all directions, that we dedicate our lives to sharing, and send our children to serve, and often times, all we can do is share the example of a life lived faithfully, if people are less interested in details. Imagine you found a cure for cancer. How urgently would you spread the news of your discovery? Who would you tell? The gospel of Jesus Christ is the cure for so many of life’s ills that Mormons want to share the good news of eternal life with the same urgency. But they find ways to have fun while serving. Here they are helping us with service at the children’s home for my sons Eagle Scout Project. 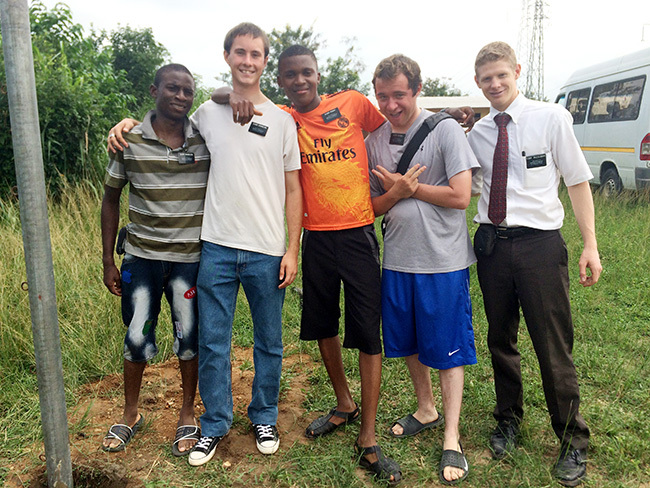 Elder M (above on right, below on left), we got to know really well, because his companion was in the hospital, so he hung with my dad and us for various activities. I found this image online of a companionship teaching a lesson. 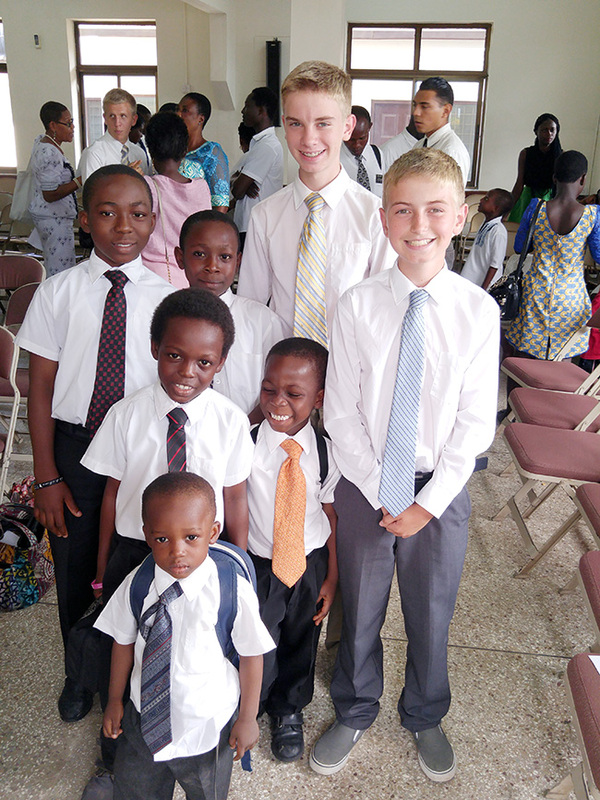 This link below is actually a GREAT read and synopsis of missionaries, I pulled some lines from there. 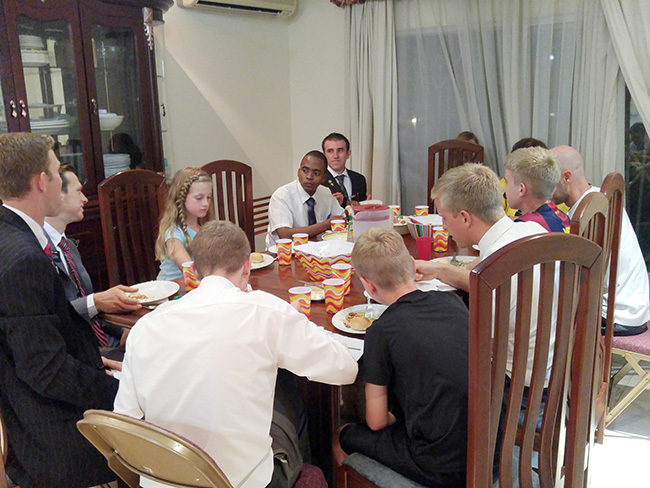 Serving a mission is quite a sacrifice, as you can see from the bullet points above. An exception to my parents service is they are asked to serve for 3 years, as they preside over the missionaries, and they CAN call us whenever, and watch movies, though they rarely have time! I wrote letters to my 3 brothers and many friends as they served missions (not my husband, didn’t know him then). I did not have an opportunity to serve a full time mission myself, though it was a goal I had from a young age. I dedicate my life to serving and sharing when I can, and my hope is to be able to serve full time with my husband after our kids are grown. 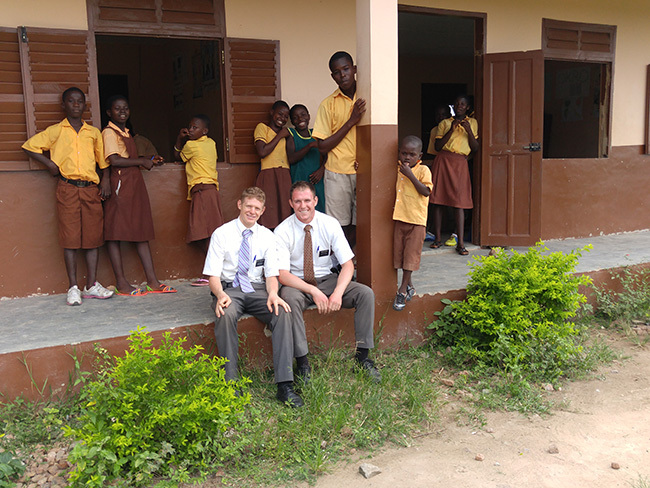 Immersing myself into my parents mission was SOOOO exciting for me, because it gave me a true glimpse of what missionaries do. I hope my children will want to serve missions, even though it breaks my heart to not have regular communication with them during this time, I see the value and the growth of an individual that comes from that kind of dedication. Not just how it blesses the lives of those who are taught, but how the individual sharing and serving experiences insight and strength. We got to observe my parents, see the many hats they wear, and also get to know a good handful of missionaries pretty well. We had dinner with 3 Elders (as they are called with their last names on their tags) at my parents home the night they were departing the country after 2 years of service. It was great to hear their stories of hearts changing, and personal conviction strengthened. 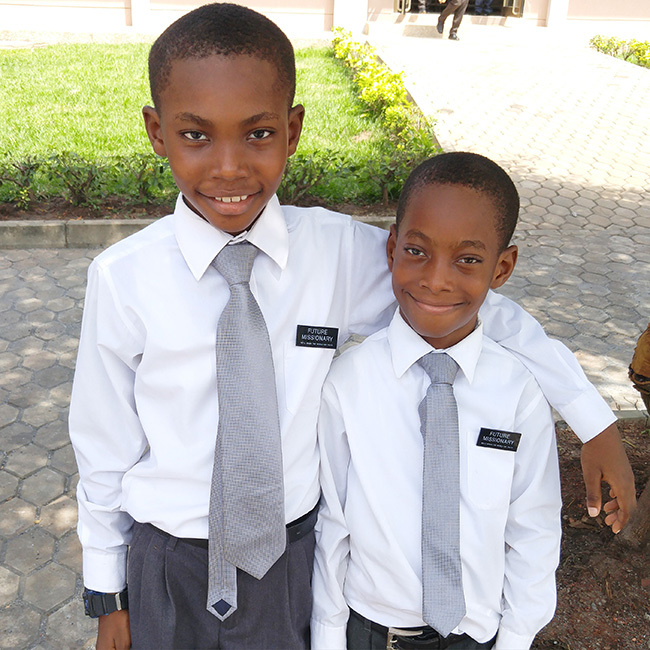 They wear the missionary tags all the time to let others know who they are, and to remind themselves that they are representing the Savior as they share messages. It was fun to watch my dad with them–same old dad. As he leads them, he has so much on his plate. 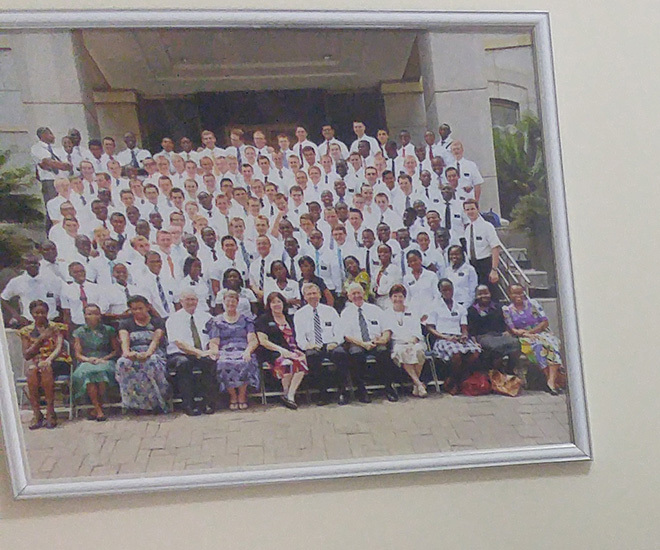 While we were there, he had to stay with a missionary in the hospital who got Malaria (from not taking his meds as they are supposed to), and he had to follow up with some disciplinary situations, but also I got to see both my parents love these missionaries as their own children. My mom works as a nurse, and caters to all of their ailments, and tells them what to do in case of sickness. A lot of Africans don’t know a lot about the pharmacy, and my mom would direct them what to get and where to go. 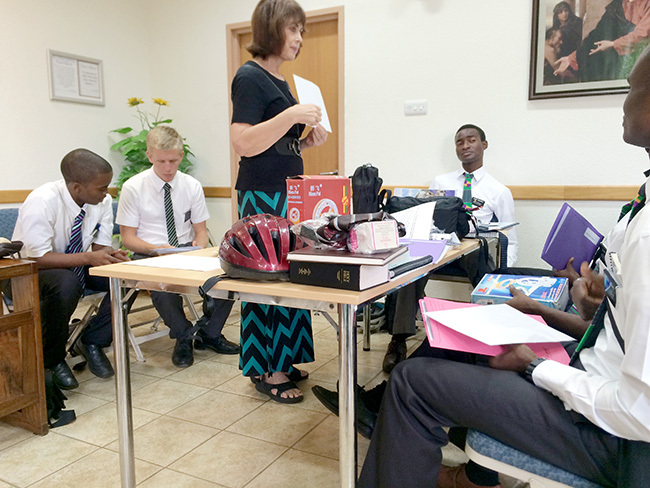 On my birthday, we got to go to a new missionary training, and pairing with their first companion. 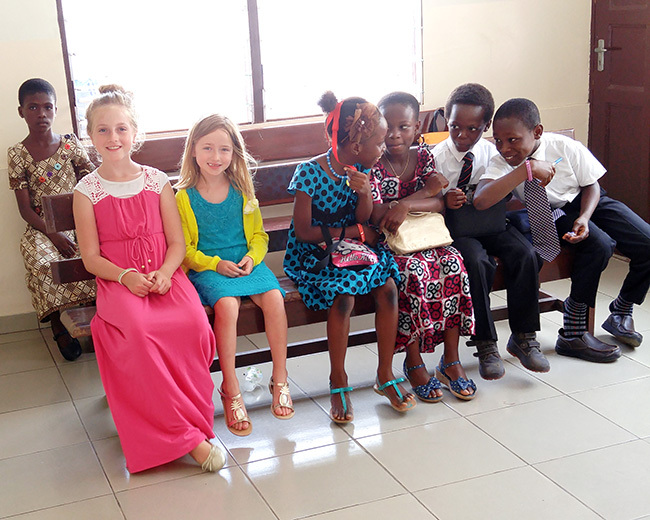 My husband got to play a fun role as translator, as all 4 of these missionaries came from French speaking African countries, and he speaks French fluently from his mission in France. 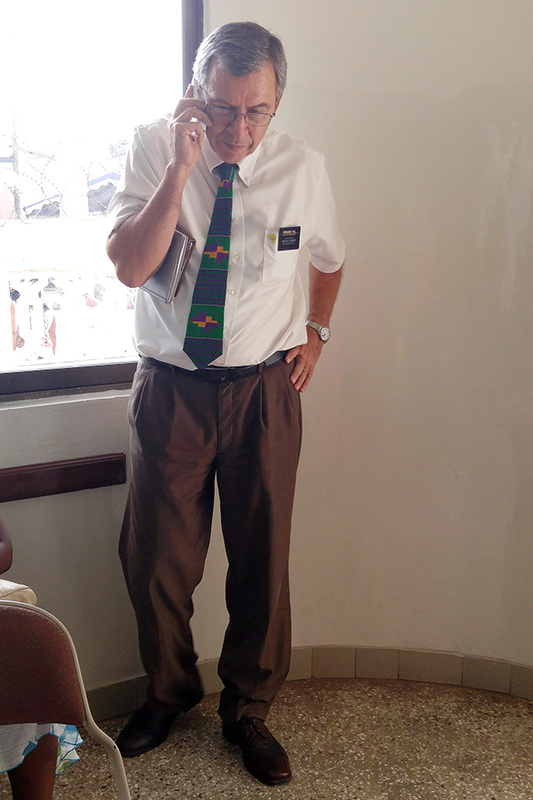 Though they learned English in the Missionary Training Center before they came, it’s so new to them that instructions like using a debit card and other day to day items, are tricky, and my dad was thrilled to have his own personal French translator on hand. These guys were so grateful for my husband, and I enjoyed watching the training, AND listening to my husband speak French. My kids were impressed, too. We usually only hear him say a word or two, not sentences or paragraphs. 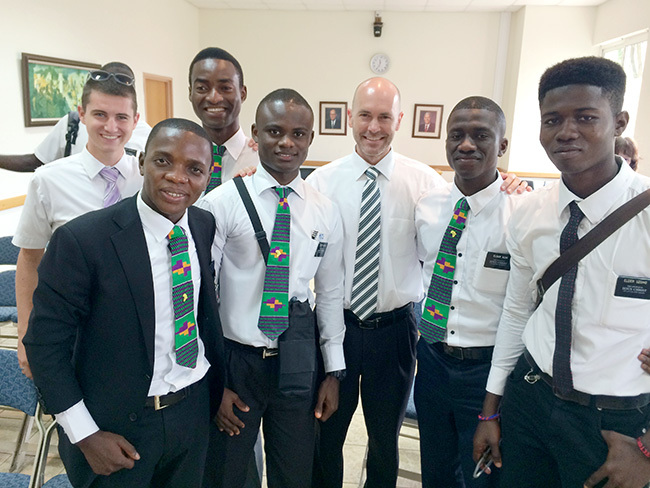 My parents gave them a tie they call the “mission tie” and they were excited to put it on, right away. 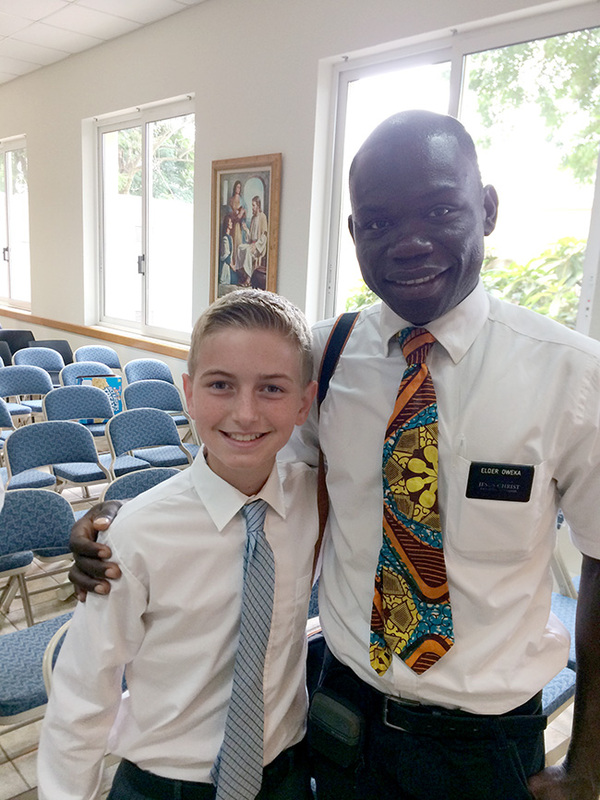 This missionary below is from Kenya, and he predicted that my second son would serve in Kenya–we shall see! The two guys on the left in the picture below, we got to know pretty well. They are the Assistant to the President, a.k.a. AP’s, a.k.a. my dads right hand men. They do a lot of stuff that my dad couldn’t always get to, and it’s quite an honor to be asked to be an assistant in a mission. They do it for 3-5 months, usually, after having served a year (ish). One from South Africa, one from the US. Another shot of the Assistants figuring out logistics on the mission cell phones they are issued (they leave personal phones back home). My husband also got to go out with the Elders below, and teach a lesson in French. It was to a humble man, whose home was smaller than our closet, and they sat on buckets outside on his “porch.” I with I was there, but just the idea of it, brought tears to my eyes. This picture is kinda blurry that I took on the wall that I cropped down, but it shows the entire mission (at one point-they are rotating in and out every 6 weeks). 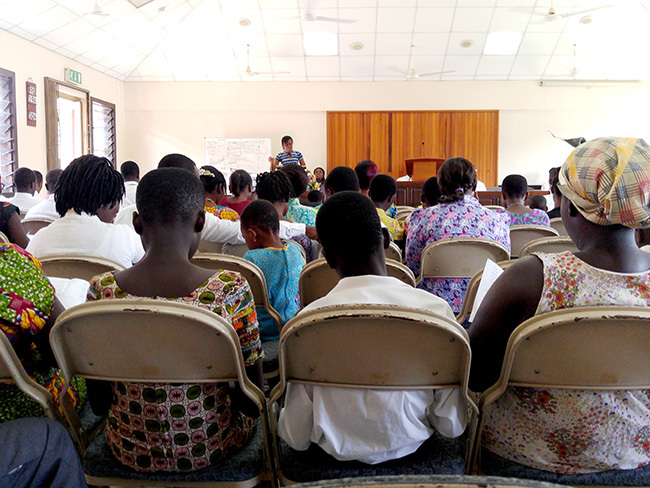 Not as many female missionaries, and only African women service in Ghana (no Americans). 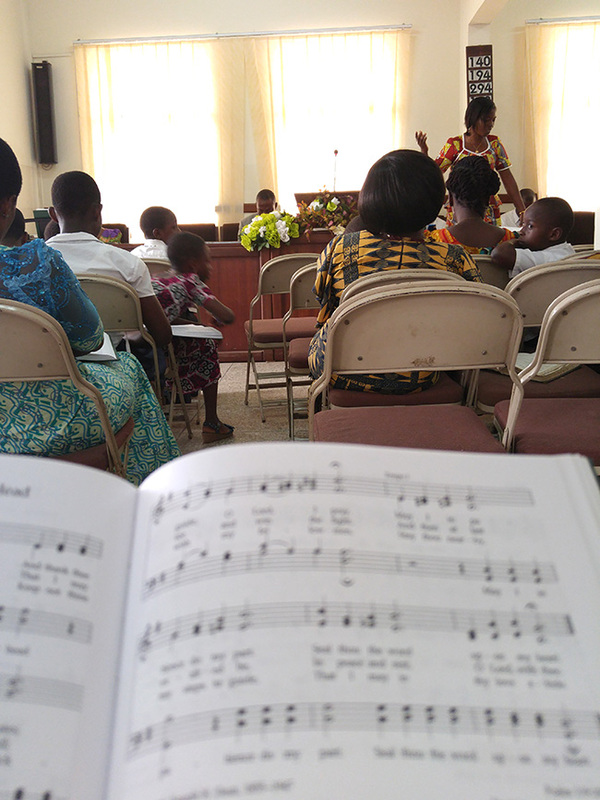 We got to attend church services 2 different weeks, and went to two different congregations. One was in the center of Accra (large city) and with no AC inside, they keep the windows open, and there was someone blaring music from a loudspeaker next door, and it was quite distracting. My dad said that was quite normal, and he felt like it wasn’t too loud. 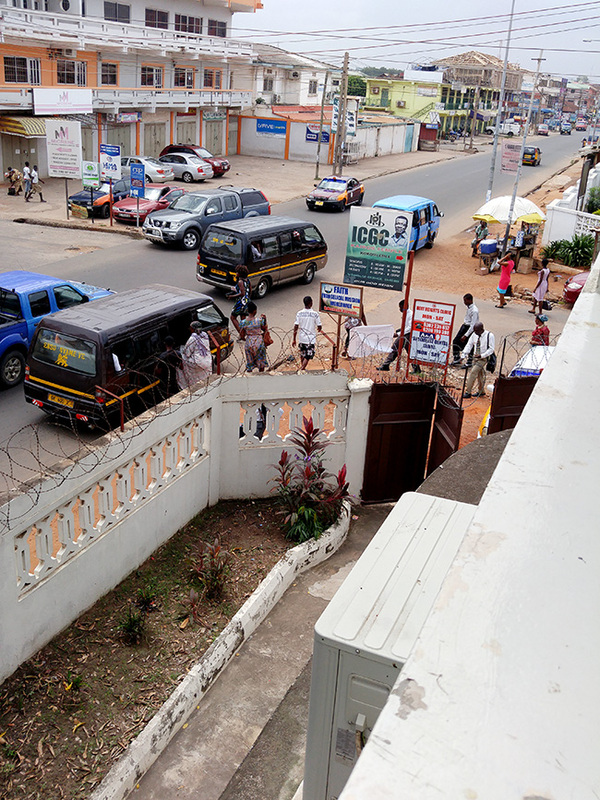 Here is a pic I took from upstairs in the church, looking out at the busy street corner. But inside, we enjoyed our Sacrament Meeting, nonetheless. Then I went to peek in on my boys in their class. Only got 1 of my boys in this shot. 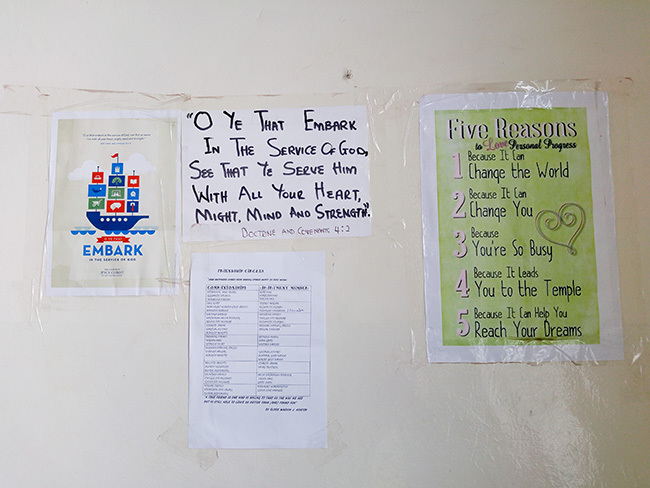 Stepped into the Youth Girls classroom that was empty, and snapped pictures of the Young Women’s Theme, handwritten, and other inspirational fliers. And I thought…I need to get them a poster with the theme on it. I had a hard time sitting still in my class with the heat, noise outside, and well…I just get restless sometimes. So I went to hang out with my girls during singing time. Met this family with 5 young boys–so adorable! 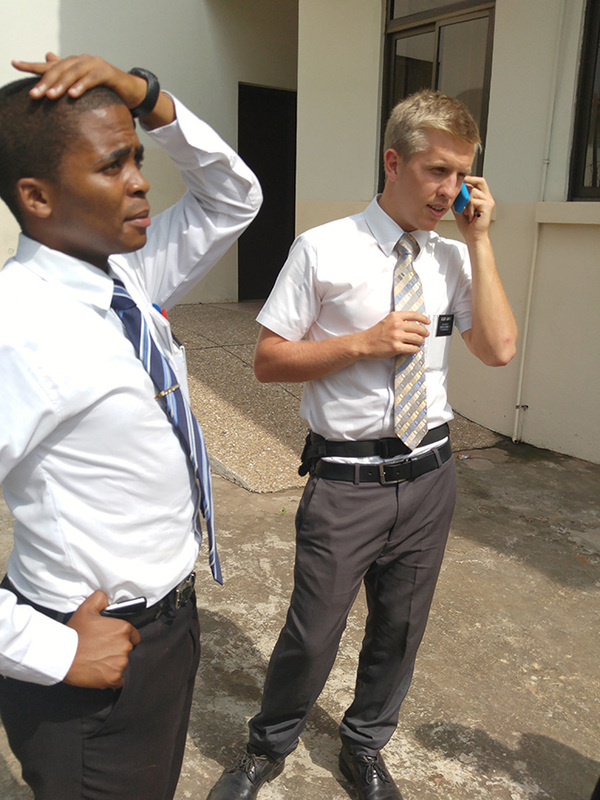 My dad had to take a lot of calls (from one of the 150+ missionaries), this was as we were leaving church. 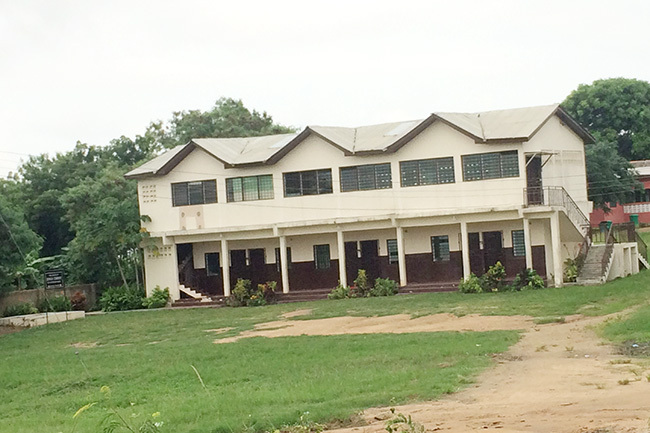 The second week, we went to a bigger building with a bigger congregation. They saw my mom and gave her a big hug. 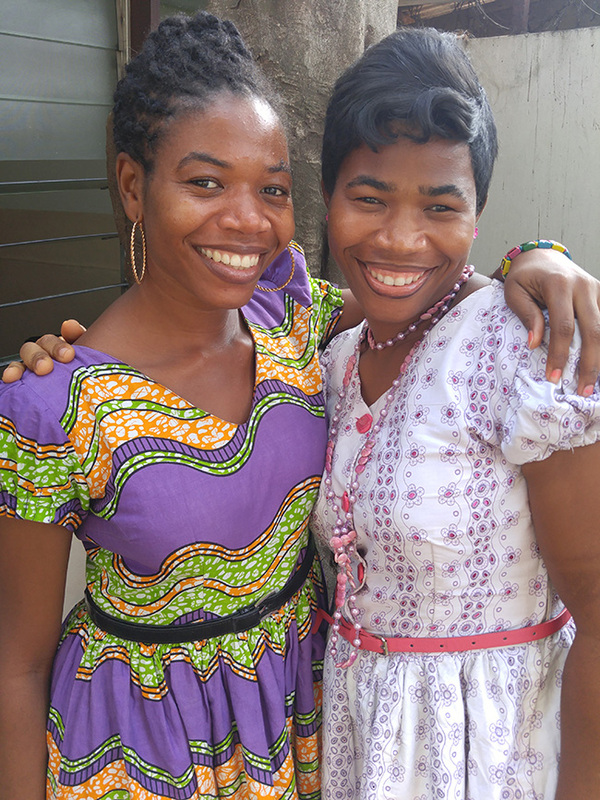 They hop around to different congregations each week, and are so excited to see them come to their wards. They even announced our visiting with each family members name at the pulpit. Special. 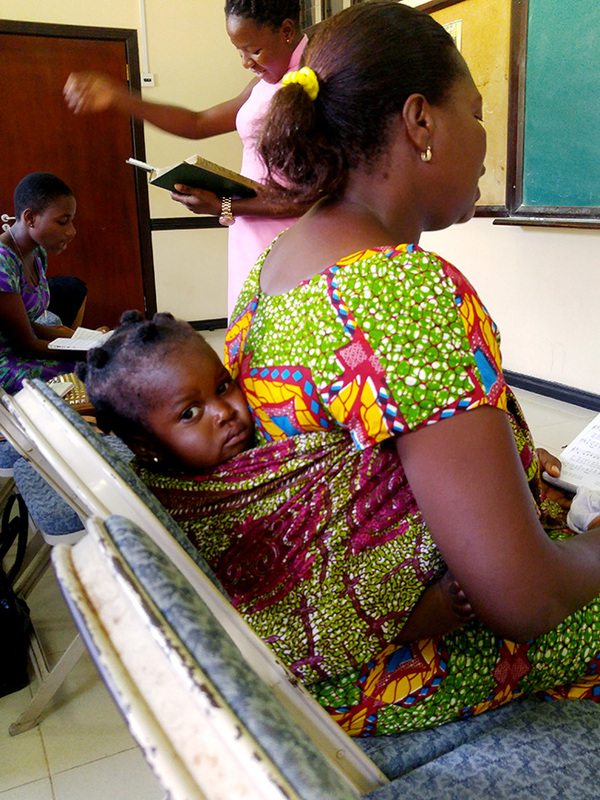 We sat next to a family with a baby, and I watched as she wrapped her baby on her back. I was antsy for a baby of my own to wrap on my back! Fortunately, it didn’t take me too long to find one! 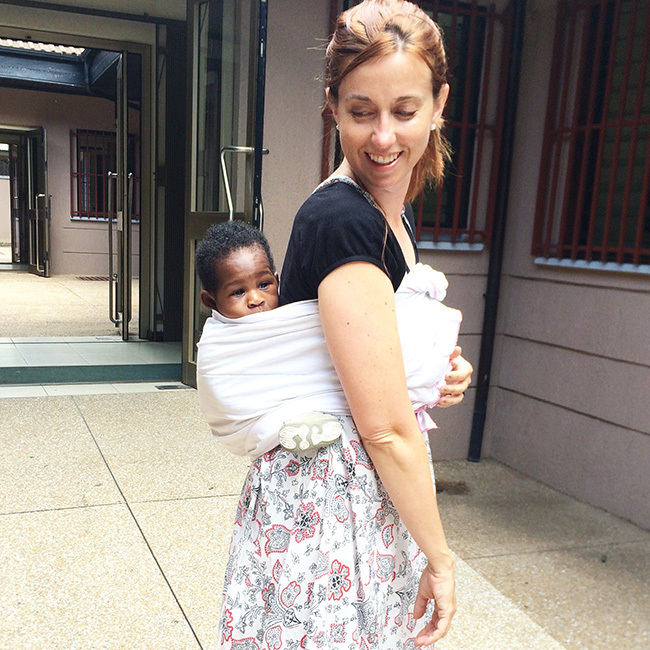 His momma is my mom’s friend, and she helped me get her baby and strapped onto my back. I loved it! He fell asleep after a while, all cozy. 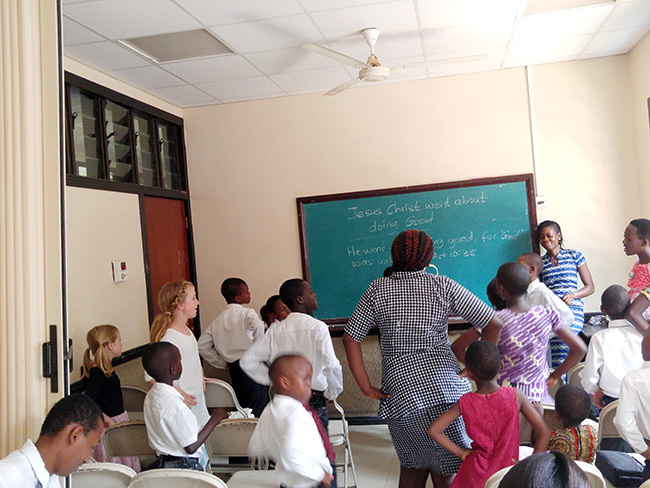 It was tricky to sit and listen to the lesson, but it was worth it. Found these cute brothers, too. 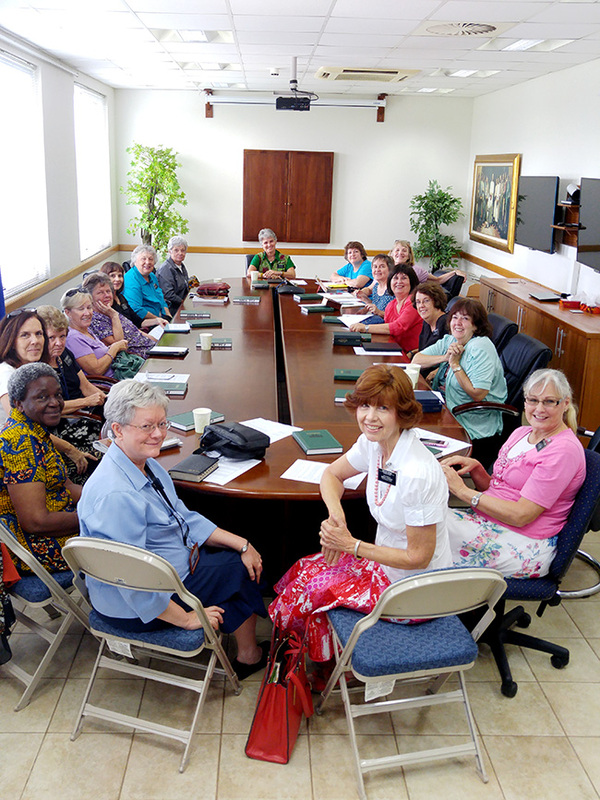 Each Monday, my mom meets with other missionary women for a Scripture Study class. 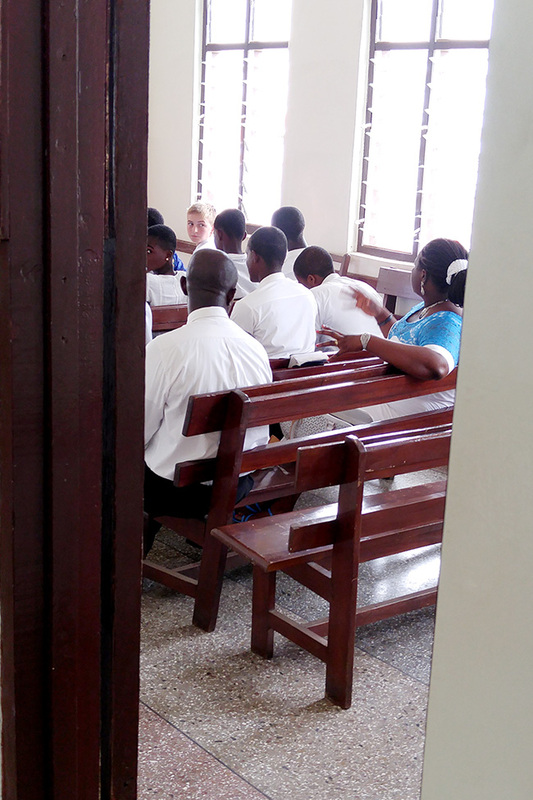 Most of them American, some from Ghana, some from Australia. It was enjoyable to discussion religious topics with them, and to find that a few of them have daughters who read my site! I got to participate in a discussion with them, and even went on an excursion one day with a few of them. We stopped at many different church buildings as we drove around, and I enjoyed seeing varying architecture on them. 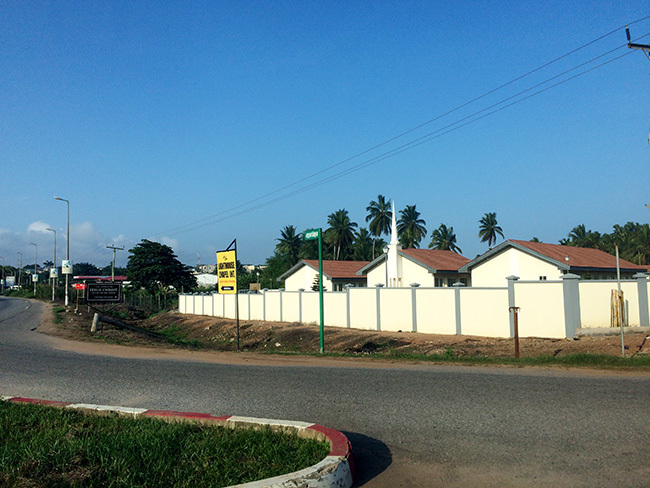 Look for the black sign with church logo on 3 of the 4 of them. 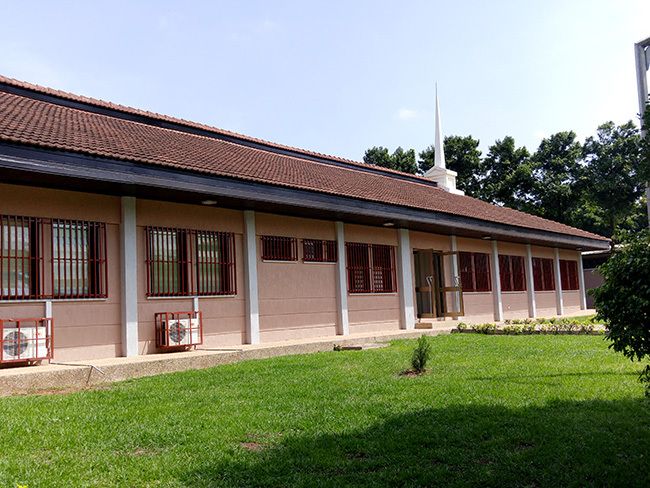 Always visible on every church building throughout the world. 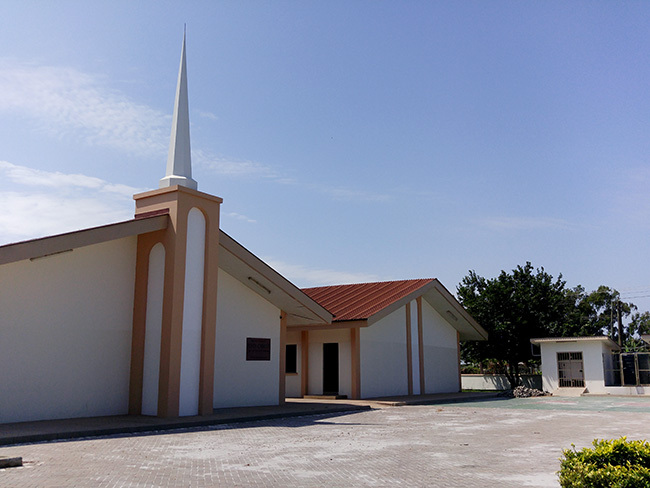 There is a temple for our church in Accra, just 10 minutes from my parents home. 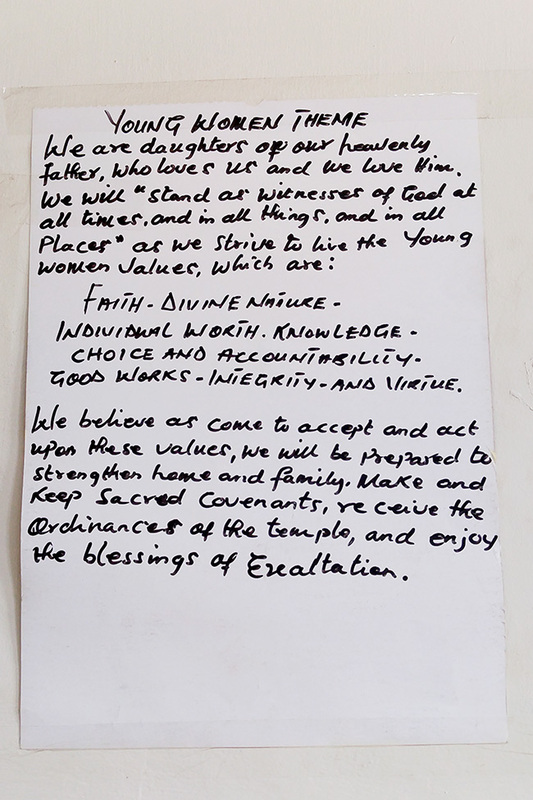 We are taught that families can be sealed our bound together forever (not just til death do we part) in the temples. 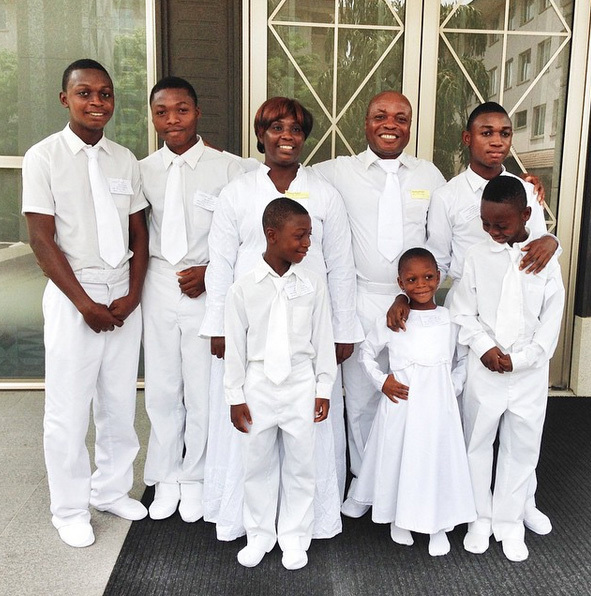 I grabbed this picture from the Instagram account of a couple working at the Missionary Training Center, of a family who are converts to the church, and went to the temple as a family to be sealed. She also shared this fabulous video of Missionaries leaving the training center (click over for 15 second video), singing God be With you Til we Meet Again, as they part ways from training, to going out into the field to serve. 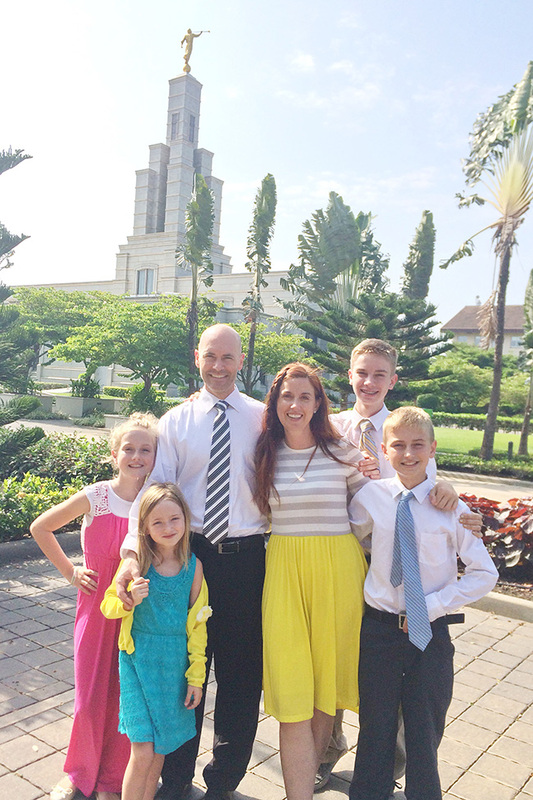 Below, is our family in front of the temple. Though my kids can’t go in until age 12, I love them to feel of the beautiful Spirit abundant on the grounds. We did take our boys in to do some service inside. 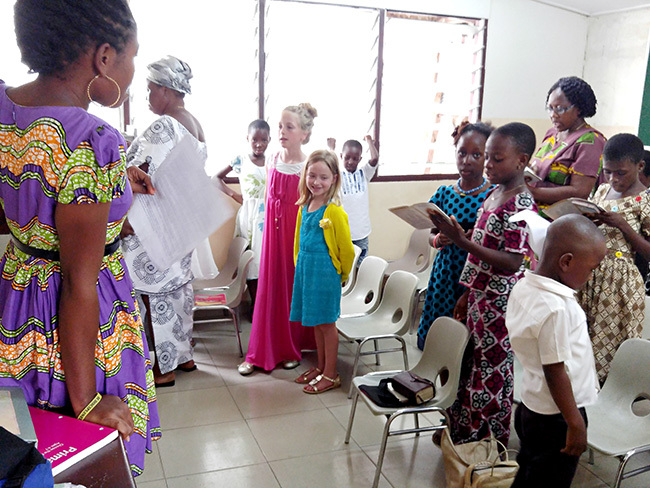 I’m going to end with this video of my girls singing with the Ghanaian children. A song they’ve both learned, on other sides of the world, but can sing together beautifully. I encourage you that if you want to explore our faith further, please read from lds.org or mormon.org, not from the haters out there on the internet. As Satan’s power is alive and well on the earth, as it was in Biblical times, people are led astray, and love to write about it, just as much as we love to share our love. With any topic you might research, would you read from the source, or from an antagonist? Please, only positive comments or thoughtful questions. I love to help anyone better understand!